For those of us in the medtech space, this is an incredibly relevant topic. A year ago, AdvaMed released a report warning that a lack of start-ups – combined with shrinking venture capital dollars – had put the future of medtech at risk. The pipeline that once gushed with innovative products has slowed to a trickle over the past decade. With that backdrop in mind, we recently collaborated with AdvaMed on a research paper that looks at how the medtech industry can survive the valley of death and reinvigorate medtech investment and innovation. Through multiple in-depth interviews and a roundtable discussion with 23 industry leaders, the Deloitte Center for Health Solutions and AdvaMed outlined strategies that could help invigorate the medtech pipeline with increased early-stage innovation. While industry leaders agree that a decline in investment threatens future breakthroughs, they are optimistic the trend can be reversed. To successfully traverse the medtech “valley of death,” large and small medtech companies, investors, incubators and the government should work together to move early stage innovation forward. In our paper, we outline two key issues need to be resolved: (1) the early stage capital gap, and (2) shrinking reimbursement and commercialization risk. These two issues are not mutually exclusive. Some medtech projects that have received funding have not been able to demonstrate enough value to be adopted into clinical practice, which has made them unsuccessful commercially. Early stage medtech needs more investment, but the sector also needs to find ways to identify and prioritize projects that demonstrate value, have the potential to be commercially successful, and can generate a return for investors. According to our research, funding challenges for medtech began with the recession in 2008. The economic downturn reduced available VC funding across many industries, including medtech. In 2010, the Affordable Care Act (ACA) was enacted, which added another layer of financial pressure in the form of a 2.3 percent medical device excise tax. In addition, along with increasingly stringent regulatory requirements for new products, the health care industry is in the midst of its transition to value-based care which is pushing providers to seek technology that offers tangible value earlier on in the development process. The medtech industry is dominated by small employers – those that have 20 employers or fewer. While small in size, these companies help to drive innovation in the sector. But they are finding it difficult to secure financial backing. According to AdvaMed, there were about 600 medtech start-ups in 2012 – significantly fewer than the 1,500 start-ups 30 years ago. Early stage start-ups have been hit the hardest, according to the group, shrinking from 10 percent in the early 1990s to 3 percent now. Industry leaders that participated in our research agree that it is no longer enough to develop a compelling clinical technology – the value of a product is now defined by the health and economic outcomes it creates. A compelling story built around a product’s ability to improve those broader outcomes is essential for funding. The many levers of value for payers, providers, and patient populations should be understood and incorporated into product development plans. Especially important is an understanding of how a product or solution’s value will be differentiated from the existing standard of care. When it comes to defining value, a broad set of stakeholders should be considered – physicians are no longer the sole medtech customer. Hospital administrators and physicians are working together on purchasing committees that are responsible for determining which products to keep in inventory. Similarly, payers, employers, and patients are considering economic costs and other non-clinical benefits when deciding whether to pay for or use medical technology. The shift to value-based care alters how physicians and health systems adopt new technology, but it also presents new opportunities. Payment models that tie coverage to outcomes allow physicians to try new technologies that might improve outcomes and reduce costs, even if they are not included under an established fee-for-service (FFS) payment methodology. Venture capital and business development executives contend that investment by large medtech companies can have a significant impact in advancing early-stage innovation. Such companies could engage in strategic partnerships as a way to access and fund early-stage innovation. Historically, large medtech companies have accessed external innovation primarily through acquisition – usually after the target company has received regulatory approval or payer coverage. Strategic partnerships, by contrast, could involve some level of financing, shared incentives, expertise, and maybe the option to acquire companies once certain milestones have been achieved. Some large medtech companies are beginning to experiment with strategic partnerships, but the amount of partnership activity does not compare to biopharma where it is common. Moreover, there has been a noticeable decline in co-marketing partnerships over the last ten years, suggesting that small medtech companies are increasingly left to commercialize products on their own. There has, however, been an uptick in co-development partnerships in medtech over the past ten years. While the increase in co-development partnerships might suggest that the landscape is changing, the majority of these partnerships have been focused on diagnostics and health IT instead of therapeutic devices. Early-stage medtech needs significantly more investment, but investors should identify and invest in technologies that can demonstrate value and quickly gain coverage, be commercially successful, and be able to generate a sufficient return for investors. The MedTech Conference, sponsored by AdvaMed, is the largest gathering of medtech professionals in North America, bringing together more than 1,000 companies for business development, capital formation, innovative technology showcasing, world-class educational opportunities and networking. It is worth noting that this year’s event was in San Jose – the epicenter of technology and innovation. As one large medtech company business development executive told us, “It’s not just about innovation. 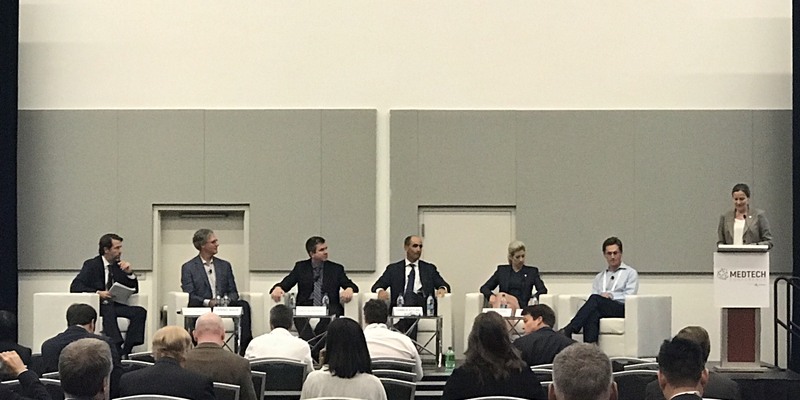 It’s about innovation that fits.” Finding the right opportunity, the right people, and the right partners is key to getting to innovation that fits, and ensuring a robust pipeline of medtech innovation. By incorporating digital technology into new products, forging strategic partnerships with larger companies, and seeking out non-traditional investors, medtech companies could tap into new funding streams, and keep the innovation pipeline flowing. I’m optimistic that medtech companies will be able to cross the Valley of Death by applying these practical solutions so they may continue to thrive on the other side. This post is brought to you by Deloitte. Follow the conversation on twitter @DeloitteHealth. Subscribe to receive other related blogs from Deloitte at A view from the Center.